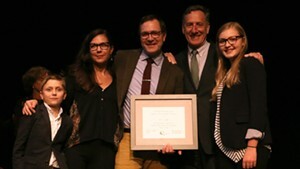 On Monday evening the Vermont Arts Council (VAC), now in its 50th year, hosted the Governor's Arts Awards at Vermont College of Fine Arts in Montpelier. 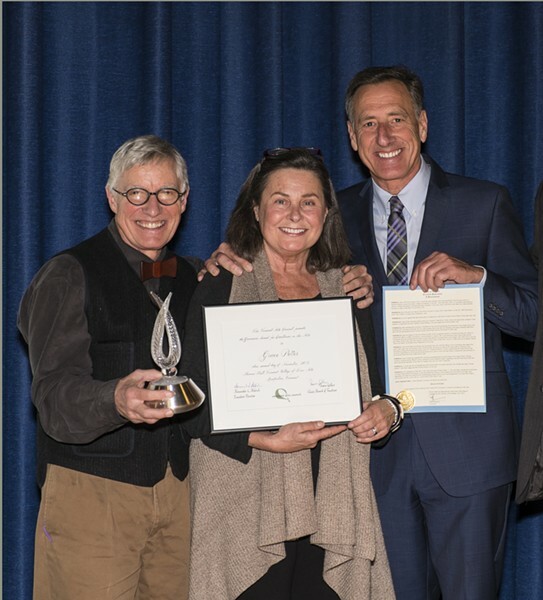 The council bestowed honor and gratitude upon 10 Vermont artists for their ongoing commitment to creativity in our small corner of the country. Graciousness and ferocity were in ample supply at the event, reflecting the tight-knit community responsible for the state's creative legacy. Waitsfield singer-songwriter Grace Potter was the event's headliner, so to speak, as the 2015 recipient of the Governor's Award for Excellence in the Arts — the state's highest honor in the creative sector. She was the youngest of the year's award recipients by far. Potter, however, was unable to attend the ceremony, due to a last-minute invitation from First Lady Michelle Obama. The singer was on her way to visit American troops with FLOTUS, along with TV late-night host Conan O'Brien. In his opening remarks, VAC executive director Alex Aldrich introduced two new awards, which he described as "reflections of our new reality": the Margaret L. (Peggy) Kannenstine Award for Arts Advocacy and the Ellen McCulloch-Lovell Award in Arts Education. Kannenstine is a painter and former VAC board chair, and McCulloch-Lovell is former president of Marlboro College. She also served as the executive director of the President's Committee on the Arts and Humanities during the Bill Clinton administration. Warren's Gary Eckhart, a painter and president of the Valley Arts Foundation, was awarded the Arthur Williams Award for Meritorious Service to the Arts. The Flynn Center's executive director John Killacky was granted the first-ever Kannenstine Award for Arts Advocacy, and was recognized in particular for his opposition to legislative proposals of a ticket sales tax and the pending statewide cap on charitable deductions. Four McCulloch-Lovell Awards in Arts Education were granted: to dancer Karen Amirault, musician Jon Gailmor and poets Geof Hewitt and Verandah Porche. An emotional Amirault referenced her 30-plus-year teaching career, saying, "I want [kids] to be able to say, 'Sure I'll dance,' and never 'No, I don't dance.'" Referred to by McCulloch-Lovell as "our benevolent pied piper," Gailmor not only delivered a Bernie Sanders impression but made sure to acknowledge schools' "unsung, behind-the-scenes heroes," including "that person, usually a woman, who sits at the desk right up front, greets everyone, answers the phone and any questions a kid can have, solves innumerable problems on a daily basis and truly runs the place." Hewitt recited a poem inadvertently offered by his 4-year-old son, and advocated for students and adults alike to spend seven minutes a day writing as fast as they can. Porche waxed eloquently, and slightly kookily, on her journey into Vermont neighborhood life as a teaching poet, and her notion of "radical receptivity." Musicians William and Elizabeth Metcalfe were awarded the Walter Cerf Medal for Outstanding Achievement in the Arts. The Metcalfes founded four Vermont musical organizations, and Bill was cofounder of the Vermont Mozart Festival, while Elizabeth was a founding member of the Vermont Contemporary Music Ensemble. 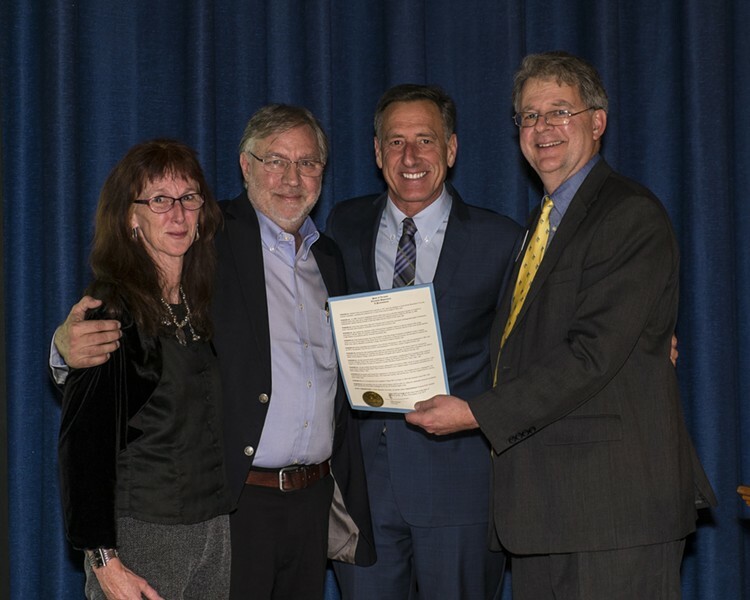 Governor Shumlin arrived in time to instate Chard deNiord, 63, as Vermont's new Poet Laureate, a four year position, with a speech infused with the humor of small-town life and negotiable townships - Shumlin and deNiord share the experience of living in Westminster West, but begrudgingly accepting Putney as their more widely-acknowledged home. "No one stacks a better chord of wood than Chard deNiord," Shumlin said. Outgoing Poet Laureate Sydney Lea read "Mixed Figures," which was written for the occasion, thus passing the torch in rather Frostian tradition. For the evening's finale, Sparky and Peggy Potter accepted the Governor's Award on behalf of their rock-star daughter. Sparky said that Grace sang before she spoke in words, and Peggy, who noted that her daughter was probably sleeping before her trip to Qatar, added, "Sweet dreams, baby, it doesn't get any better than this!" The evening closed with a prerecorded video from Potter, who said, "It is with a heavy heart that I can't be there tonight." She thanked her extended Vermont community before offering an acoustic performance of "Empty Heart."